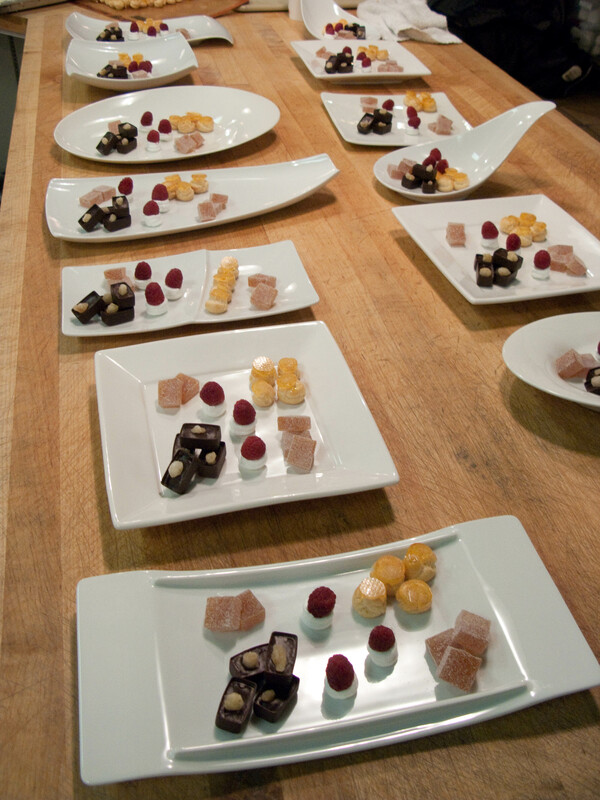 We just completed the 2nd 180° Dining event for this class and the last one for the year. 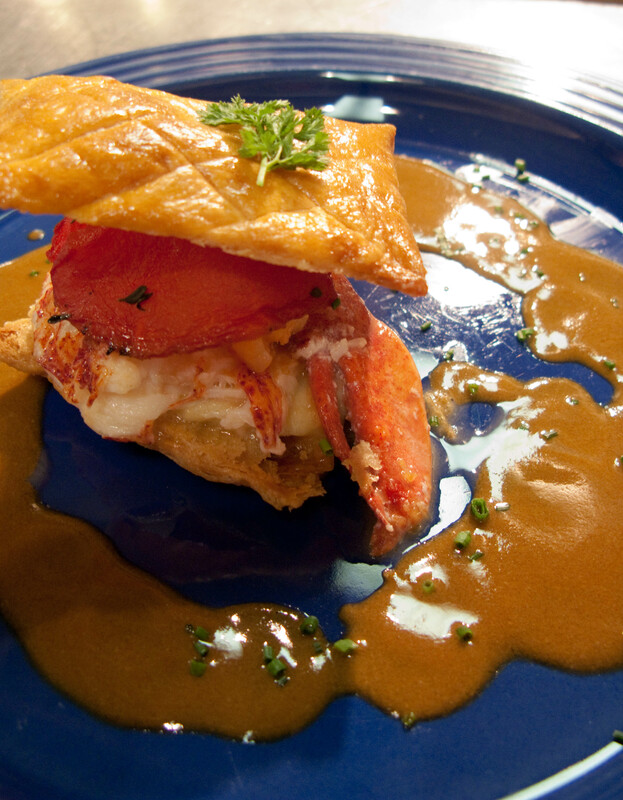 The theme was Reveillon or a French Christmas celebration menu. When the French set out for the preparation of a Christmas or New Year’s dinner they pull out all the stops. Oysters, smoked salmon, caviar, foie gras, lobster, good beef and of course tons of chocolate and other sweets. It was with this in mind that we created this menu. Many of our student’s families were in attendance and even a prospective student for the class that starts in March. The students did a stellar job and worked well as a team. 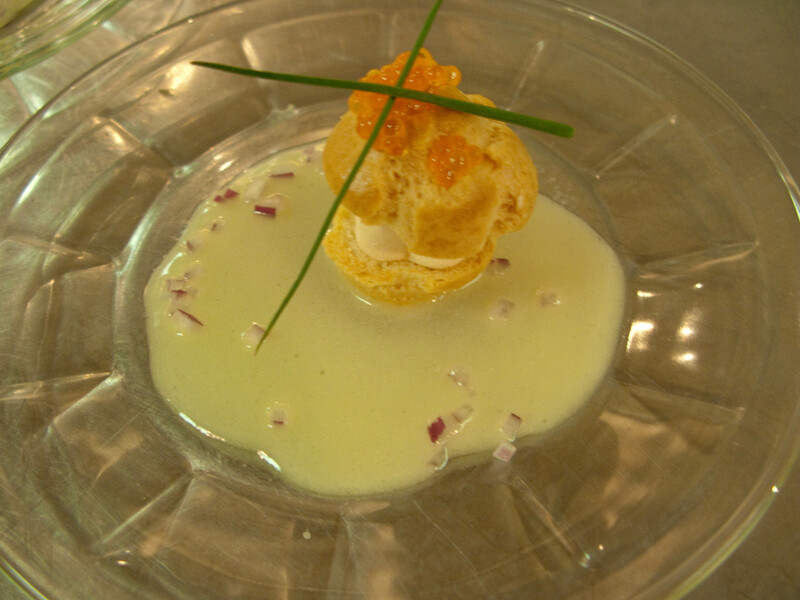 The amuse was a smoked salmon bavarois profiterole topped with Trout roe and served with a beurre fondu. The evening was not without its share of issues to put a monkey wrench into an otherwise flawless dinner. Our sommelier recently broke her ankle and was making a valiant effort to be at work each day to teach the new class, but on this day her infection got worse and she had to be admitted to the hospital. She was contained in a bubble to avoid any further infection and obviously could not do her usual presentation of the wine selection. 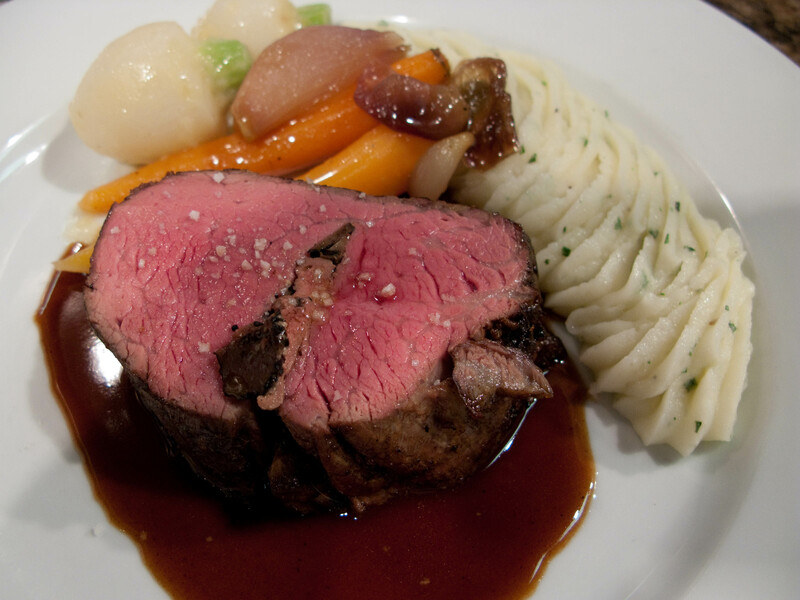 Also in the heat of plating one of my students Duane’s world was re-supplying us with tenderloin from the combi oven. We were on our last two tables and I asked Duane’s world to grab two more tenderloins. He responded that there were none left. “What do you mean there are none left.” I go over to garde manger and he is looking into the combi and shaking his head. I look into the combi and see they are on the top shelf which is slightly hidden out of view for a man that is 6’5″. Of course I had done my calculations properly and there was the right amount of tenderloins roasted for the number of clients we expected, but I still suffered a minor coronary when I first heard his response. Normally we do these events on a Friday night, but since we are in full Christmas event mode at Cook Street we had to return the following morning to teach the 180° program. Since our sommelier was in a bubble, I was going to have to lecture my present students on charcuterie and then go to the wine room to lecture my new students on the Loire Valley and Bordeaux wines as well as do a complete review of all the French wine growing regions. The following day I believe is the longest I have ever lectured in a single day. Debbie our sommelier is apparently free of infection and is just having a reaction to the medicine they prescribed. She has had a rough year and I am sure she will welcome a healthy and accident free 2010 as will I.